The experience of Morrison Company extends far beyond rack and storage to a full complement of modular and prefabricated structures for aesthetically pleasing and functional work environments. 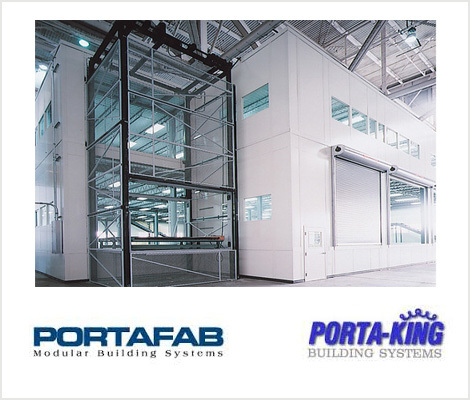 Relying on the PortaFab and Porta-King lines of modular products, our team will design an economical solution that is fast to install, flexible for future growth, and yet strong enough to be a safe space for personnel and expensive equipment. Modular buildings can include: offices, clean rooms, machine enclosures, paint & finishing rooms, and more. Modular walls can serve as full or partial partitions and/or sound barriers. Prefabricated buildings serve as custom designed guard booths (incl. high security/ballistic), equipment enclosures, control rooms, gate houses, etc. Rely on the expertise of the Morrison Company designers and engineers for your modular work space needs.